It’s become kind of a landmark these days. Though a landmark to or for what, leaves natives and tourists alike scratching their heads, babbling to themselves. And there will be those who probably never stopped because it seemed a bit of a local blight in their eyes. Because it wasn’t one of those modern refilling unservice station/mini marts where well-dressed customer-attendants, without a speck of dirt under their fingernails, or a dab of grease on their pressed clothing, couldn’t tell you the difference between a sparkplug and a quart of 10W-30, let alone know how to change either. But this old falling-down gas station with the old man and all the junk in the dark inside and car parts and tools and beehives and junk all over the place and fiddle hanging above the cash register and the stove smoking and the dog in a dead sleep against the wall and the blue neon clock glowing in the window all night long, and Gust bent over some engine with a wrench in his hand saying, “Yeeeeeeeeep,” and the derelict cars and the old schoolbus outside rusting in the weeds … all this was Gust Klenke, And Gust Klenke was all this. 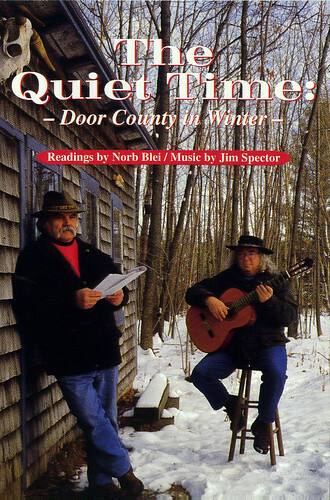 And we need to be reminded of this occasionally, especially now as the county goes Condo and Cute, and before every vestige of the real Door County is homogenized in the humdrum of urban slick and country fake with shops called ‘The Maple Closet’ and ‘Heaven’s Gate’. So smile, tip your hat, say a little prayer, or toot your horn to the ghost of Gust when you pass by. His place had ‘character’ (still has, what’s left of it). Something almost impossible to find in most of Door these days, as we either tear it down, rehab it into something it never was, or build in the current vogue of Door County Country-Cute-Kitsch. All of which is false, all of which is phony. All of which makes about as much sense as Gust Klenke alive and well, driving a BMW and dressed like a yuppie. Downtown Ellison Bay still seems a little purer, a little more authentic than what’s been happening in most of the towns and villages of Door these days. Late at night, I like to think of Gust in his dimly lit garage, wearing his grimy bibs, with tools and rags and pencils sticking out of his pockets, his old cap hugging his forehead, bent over, struggling to fix the carburetor on some small engine. The blue neon clock glows in the window … he opens the door and steps outside, onto the gravel, the smell of raw grass and the scent of summer lilacs . . . and takes a little stroll toward the Viking for his usual cup of coffee. The street is empty. The town is quiet. A potter has replaced the gallery across the street…the small building where the market once was. The post office is no longer in Walter Severson’s house, but the house still stands, and so too that beautiful white frame house of Clint Rogers and his wife … a family with some history to Ellison Bay. Will’s Cottages remain the same, thank God or someone for that. The most authentic lodging to be had in Ellison Bay. Rustic and real. The Town Market too, is what it is. So too the Viking, where only a few of Gusts’ old cronies are to be found at the counter these days. No comment on the church across the street. Let that out-of-character design speak for itself. The Norrland looks great. 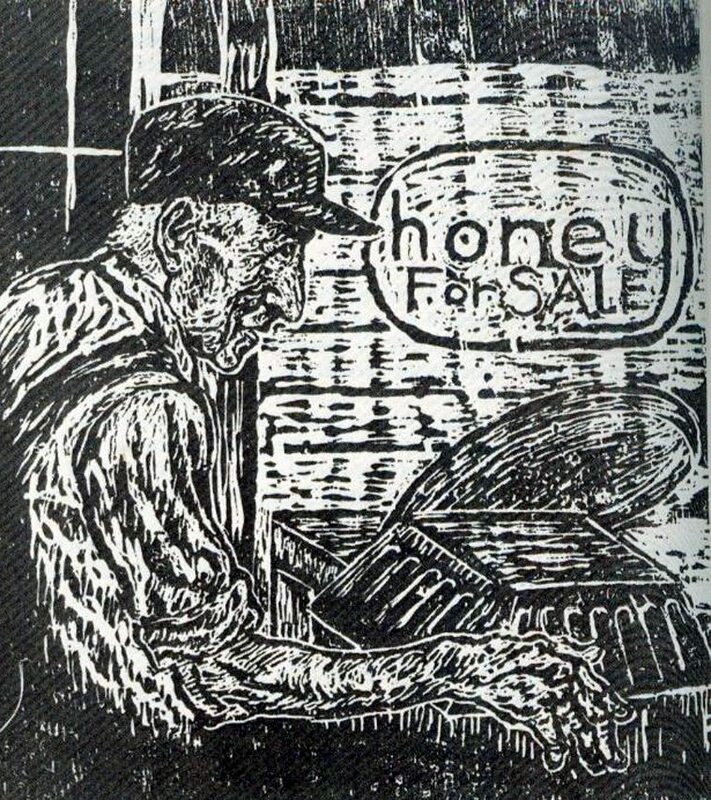 So too Kenny Gobel’s station. Who can explain the Greek Parthenon of Ellison Bay that once wag Clayton’s? Till’s fits in perfectly. So too the abandoned, old Door Reminder… and all the rest down the road, and up the hill, all a little beyond an old soul’s nightly sojourn. Heading back to his garage, a flashlight in hand, his dog at his heels, the ghost of Gust thinks the old town “ain’t so bad yet, but sure is changing.” He wishes whoever took the blue neon clock from the window of his garage would put it back, leave it there for the local folks, the travelers, the world of Ellison Bay and beyond to keep time by. That would be a nice-enough memorial, a remem¬brance of old Gust. Leave the station stand till it falls. And leave the light of the clock glowing in the window for all a them that needs to be reminded that time passes for everything and everyone. Though the memory of the real, like Gust Klenke, has a life of its own. Yeeeeeeeeeeeep. Yes indeed, Norblei. 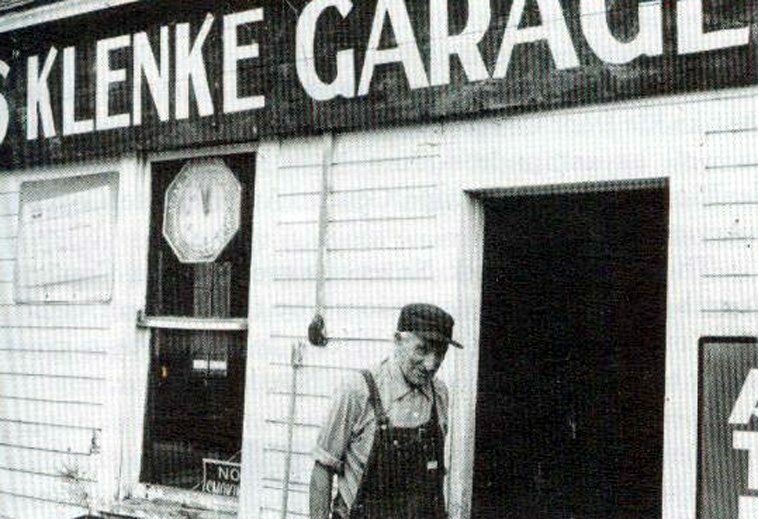 As a visitor to the Door since the 50’s I always cherished that Klenke garage, a touchstone of authenticity and excruciating, almost, charm. The old vehicle parked diagonally next to the rude hut, I always wanted to own it but then it would not have been there for others. The blue neon clock……..yes! Be it returned. The cute and kitsch you lament as a resident of less spoiled Ellison Bay, sighting the new ruins up and down the peninsula, mightily warrants your touching reportage and plaints. Wish I had met Gust. I miss Freddy and Eldred Koepsel. They all are a part of the Door County fabric that has been worn away. Not ripped from us, just worn out. First trek to Door > 1972. Being from Michgan & having watched the degradation of Traverse City for a couple decades, I feared Door faced a similar future. Annual treks to the Door confirmed what was coming: every summer, something dear had gone missing. Moved to Door > 1997. By then the decline had jumped to light speed, losing even “new” landmarks in the wake of yet NEWER, BIGGER, PRICIER cookie cutter construction (the second DuNord, gone … the entire heart of Founder’s Square backlots traded for a drainage canal … Liberty Park Lodge currently on the chopping block). Painful. Want to see what’s coming? Check out Traverse City. Then watch closely ~ “this” is nearly a memory. A dear and painful, memory. Jude, hey. Thanks Norb. Brought me back to a time in the 70’s when I stayed at Wills. I forgot my jeans but did just fine in a pair of my husband’s held up with a rope around the waist. Stayed up most of the night reading by the fire (I didn’t have a fireplace of my own in Chicago). Searched the county for plums for a friend to make plum-kuklen. There were three couples on that trip. Most of the time though it was just a friend and me. We stayed in little cottages then finally the original DuNord. Hated what they rebuilt after the fire and never stayed there again. Have to admit the last visit (other than to go to The Clearing) I stayed in a nice B&B called High Point, got snowed in and wound up the only two people in the place after the staff went home. (They said we could run naked in the halls and no one would know–we never told whether we did or not!) They had to dig out car out with a plow in the morning. Good memories. Thanks for tweaking them. What a truly lovely Valentine … thanks, Norb. of your words of appreciation before he left this plane. 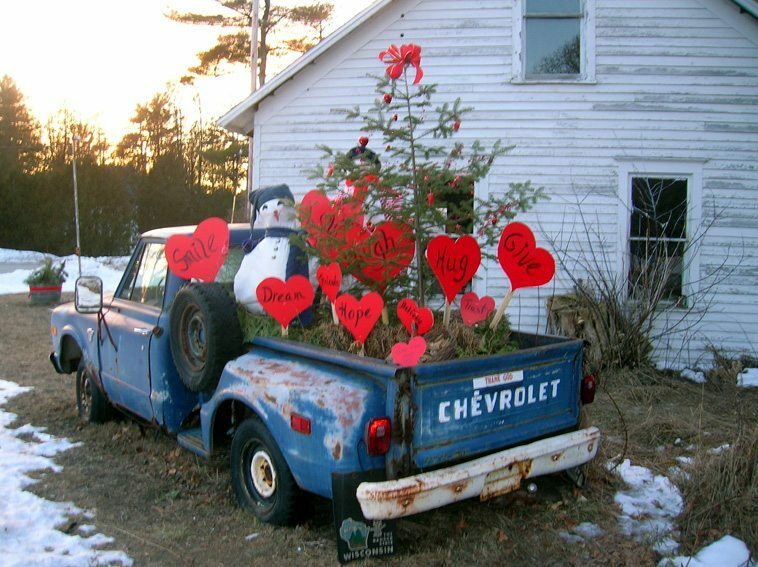 Liked the way you decorated the old truck. Happy Valentine’s day to you and Jude, too. What a Terrific Idea….I remberer getting gas and having car worked on back in the 50`s . Gus would be proud !